Ever wonder why soccer is the world’s most popular sport? With a little bit of fancy footwork, our coaches provide our athletes ample opportunity to explore just that. This year we kick it into gear emphasizing offensive and defensive strategies, shooting, passing and goal tending. Players of all skill levels are encouraged to try their feet at this fast-paced, international sport. Daily shoot-out drills and competitive games between campers and the staff always provide great athletic competition. Soccer shoes and shin guards are a must! Always a summer favorite, our sports staff packs the day with various activities for the general sports enthusiast. Games such as: lacrosse, dodge ball, volleyball, kickball, basketball, soccer, wiffle ball, capture the flag and Ultimate Frisbee are just a few of our favorites. Each year, new activities surface as our visiting tourists challenge us to a new game or two — football or “futbol” anyone? This camp will excite even the sports novice. Campers will compete in: tug-of-war, “big ball,” the parachute wave, the 50 and 100 yard dash, the egg toss, sack races, shuttle-runs, obstacle course races, hurdles and relays, relays, relays! This is a camp that will get the competitive juices flowing. Come to sports camp and play with us! Is a week full of traditional ball sports: basketball, softball, flag football, volleyball, and soccer combined with some non-traditional alternatives: bocce ball, croquet, broom ball and water polo. We may try our hand at juggling and a friendly, competitive softball throw — and who knows, perhaps a dunking tank to work on those “pitching” target softball skills! Come join in the fun; it’s going to be a ball! What can you make with a blue,yellow, black, green and red hula hoop? Come to camp Olympics and see! Camp staff will be the judges and referee’s for a weeks worth of competitve fun. We plan to mix some crazy play along with the traditional summer events; so put your thinking and sun caps on — and join us for some gold medal fun! We culminate our summer-fun by drenching our opponents. Does water balloon lacrosse, water balloon bombardment, or sponge bomb Frisbee appeal to you? How about a slip and slide competition? There is always something special in store for our final week of camp. 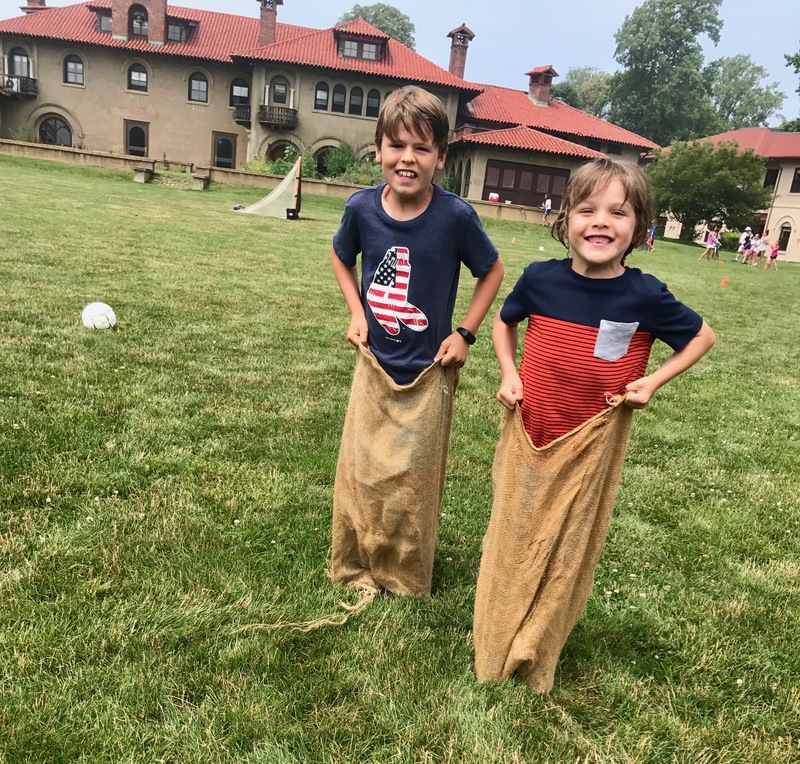 At “Summer at St. Michael’s,” you will certainly “soak” up some rays and remain “cool” during the long, hot August days! St. Michael’s has teamed up with the Tennis Hall of Fame once again to offer a week of Tennis Camp for two different age groups. Both camps offer the option of a 30 minutes swim at our on campus pool. Transportation will be provided back from the Tennis Hall of Fame via our school shuttle. Tennis Guppies (for children age 4-6): includes one hour of tennis instruction at the THF. Camp runs from 8:30am to 1pm. Half day only. The fee is: $310/week. Children will be dropped off at the THF in the morning. Tennis Sharks (for children entering 1st – 4th Grade): includes 1.5 hrs of tennis instruction at the THF. Camp runs from 8:30am to 1pm with the option of a full day. The fee for a half day of camp is $335 or $385/full day. Children will be dropped off at the THF in the morning. *Lacrosse camp is $335 per week/half day and $385 per week/full day.